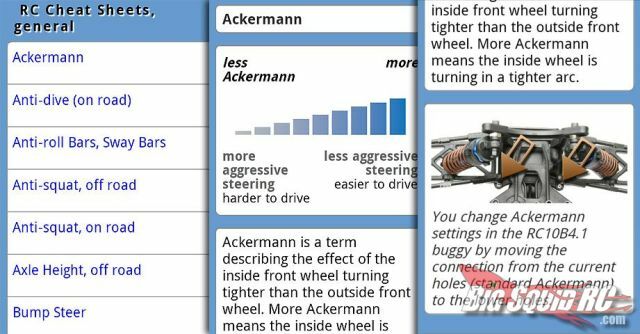 RC Cheat Sheets app now on Android « Big Squid RC – RC Car and Truck News, Reviews, Videos, and More! So now Team Associated has come to their senses and released their RC Cheat Sheets smart phone app for Android based phones. It shares all the same features as the iPhone version, but now it works on phones that don’t require you to wear black turtleneck shirts and thick framed glasses. Some of those features include setup sheets for most AE cars and trucks, a lap counter, maintenance checklist, and various calculators for gear ratio, roll out, final drive ratio, and transmission ratio. There’s a ton of other tools included as well and since it’s only $2.99 in the Android Market, it won’t cost you a lot to find out what else is in there. Check out the Team Associated website for more info.